That's Cpl. Ellner! I was promoted posthumously in Telford! Edit- is it possible you could increase my Leicester drops to 2 please? Thank you! My MegaCon (Orlando) drops are now up to three. Update kindly requested at your convenience. Add another Orlando for me as well please. RIP Pvt. Chris Chulamanis A14/TQ4.0.66993E7 You are missed. Jay, your ribbon's update would already be showing if you were using the link I provided for it. This goes to all you marines with ribbons... please use the link give you, updates will show up without any modification needed to your sig. Thanks, Dom, I will do that. Just thought I save ya a smidgen of bandwidth. I pay for total hosted data, so bandwidth is not an issue... and all these little image are less than 100 kb... so you can have one on me. Kevin has found us a supplier of ribbons and in consequence, all of our ribbons (on the exception of Atlanta) will be modified. So, this is a reminder that you should use the links that I provide for you to you ribbons as the update will show in your sig automatically. Once the changes have been finalized, we will show you where you can obtain them for your uniform. For all new marines, or those without ribbons... feel free to enter your request here... tell me in what city your convention took place and how many of those events in that city you've done in USCM uniform. Just out of curiosity, was there ever a ribbon done for the guys that did the drop at the Pyramids Centre in Portsmouth? I assign ribbons on a "per-request" basis... and I have received none so far. Last edited by SGM Baldwin on Mon Mar 17, 2008 5:12 pm, edited 1 time in total. Could I get a few ? 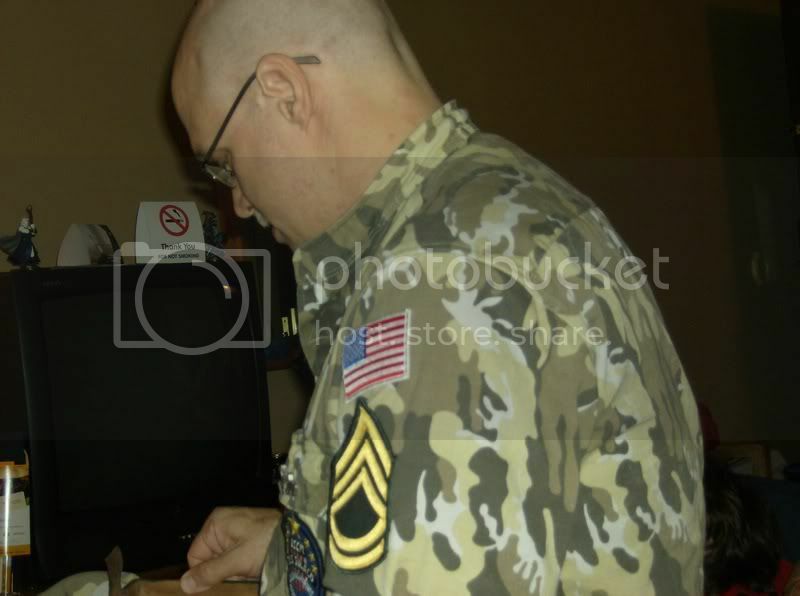 Were you at those cons in USCM uniform? Come on guys! Get ya finger out and request a ribbon! Here is some photos of the Monster Con in Salisbury N.C.
which will be moving to Concord N.C. this year. http://spotted.Salisburypost.com/pages/ ... ery=295972 I'm on page 5 photo 4 ( lousy photo ). No photos from the Heros con, but i should have some this year. Please exclusively use the image link provided, all updates will show up without any other modification needed. 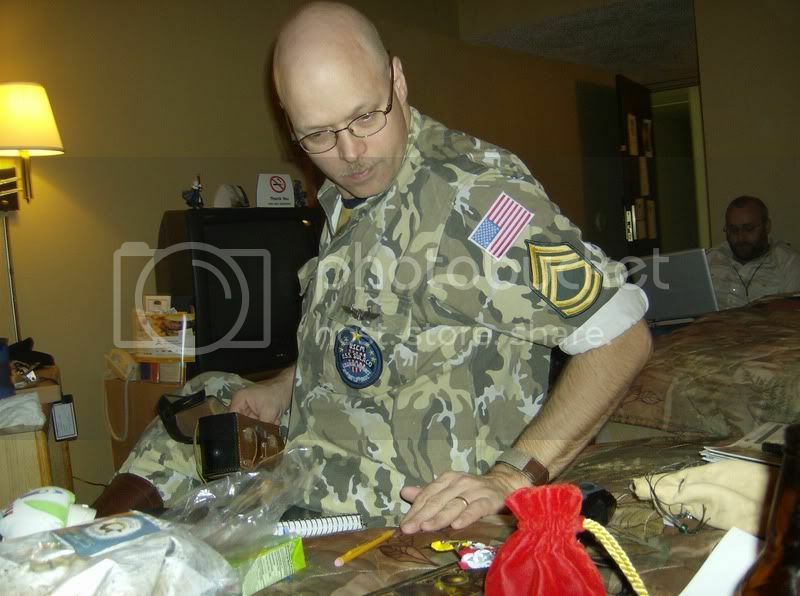 Hey, so I've been sort of absent for a while now... but, did I read your post right, in that ribbons will now be physically available for uniforms? Ok marines... here's some NEW & IMPROVED. First, I'd like to thank Kevin for finding a convenient way of obtaining ribbons for our uniforms... From now on, all ribbons assigned for drops or other achievement can be obtained through paradestore.com. As you know, alll of your ribbons are stored on my PBase and can be seen here: http://www.pbase.com/sharpuscm/recipients If you go and click on your name, you'll see the names of each ribbon and what achievement it represents. So you want to buy these ribbons and stick 'em on your chest, eh? Very simple. Take note of each ribbon you've earned and return here: http://www.pbase.com/sharpuscm/ribbons If you click on the Atlanta Colony Campaign ribbon, you'll find its colours, and best of all a SKU which you can enter at paradestore.com. Be sure to switch your search criteria to SKU when searching for it. Doing a search for the Atlanta ribbon SKU RBN16RYGORY gives us this... click on "View Details" and you're ready to add it to your shopping cart. Yes, it's that simple. Some ribbons are "flipped" meaning they are worn with a 180° turn. This helps to maximize the potential use of each multi-cloured ribbon. You're a real combat veteran with more than one drop? Add a numeral! Numerals are available here: http://www.paradestore.com/detail.aspx?ID=555 I recommend a bronze finish. You have an option to select "Ribbon Slide and Clutch" or "Ribbon Only". The option with clutch is for marines with one decoration and "Ribbon Only" is for decorated veterans such as Tony Leach or myself... who will need Ribon Bar Mounts. Parallel rows of ribbon bars will either be spaced 1/8 inch apart or placed together without spacing at the individual's option. For service in uniform at a colony drop in spite of injury or illness. Awarded for successful patrol of a colony of 38'000 colonists or less. For previous service in a military or para-military organization other than Colonial Marines. For service in uniform at a Colonial Marines Colony Drop Operations Table exceeding one hour. Awarded to a marine who served at any drop in uniform in 2008. So... if you qualify for any of the above ribbons, please let me know and I will update your digital ribbon bar. Last edited by SGM Baldwin on Fri Mar 21, 2008 3:37 pm, edited 2 times in total. BTW, I'm sorry I've been absent. Was in a car wreck, dealing with family problems, sick... the stress has been immense and the list goes on and on. Would it be possilbe to get a ribbon assigned for the Con we have here in Fargo ND. It is called Valley Con up until last year for some odd reason the went with the name - The Fargo Entertainment Expo. 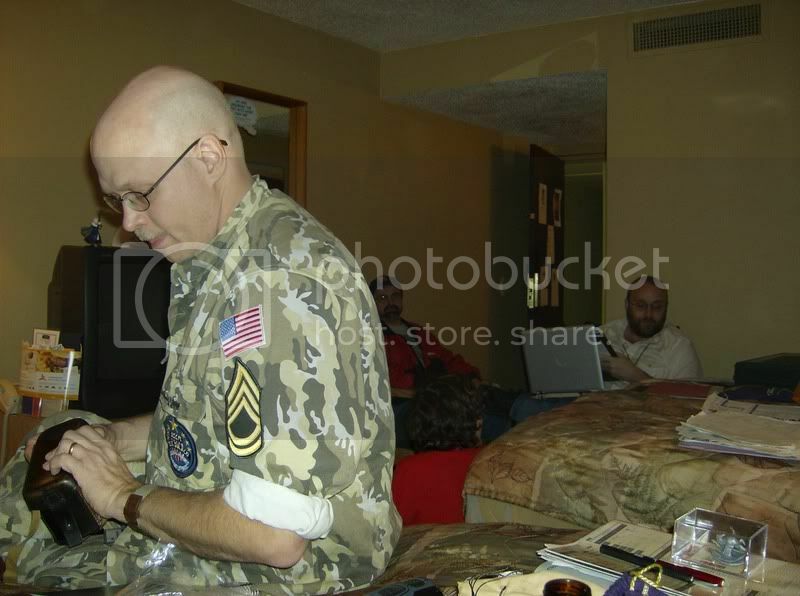 The only pictures I got left after stupid computer crash are these 3 on photobucket and it was in room while getting ready. Dude! Sorry to hear of the bad news. Hope things are getting better! About the Dress Blues. I've been quietly working on a finished uniform over the last few weeks or so. There have been some 11th hour revisions, most minor, some a little bigger. I'm awaiting some deliveries to arrive before having a finished product (should be within the next couple of weeks or so). At that time I'll reveal what I'll be wearing for my USCM Dress Uniform at D-Con '08. Image may seem large, it will be updated by tonight.